Minutes before Apple CEO Tim Cook took the stage to announce a variety of new products and services like HBO Now and Apple Watch, Google touted individuality in its latest Android Wear video advertisement. The message targets young, hip individualists dancing with Moto 360s and G Watches as part of the Android campaign "Be together. Not the same." Unlike Google, Apple's advantage lies in its 453 retail stores worldwide, along with online sales. More than 120 million customers visited Apple's retail stores in the fourth quarter of 2014. Apple Watch will become available on April 24, but the company will begin taking pre-orders April 10. While the least expensive will sell for $349, the most expensive, the Apple Watch Edition with a solid gold frame will sell for $10,000. Behind each timepiece -- accurate within 50 milliseconds, per Cook -- consumers will find features like Glances, which allows the wearer to swipe up from the bottom of the watch's face to check heart rate and find other information. A tap on the wrist allows wearers to check and respond to email or receive calls. The Watch also allows wearers to pay for purchases with Apple Pay at participating merchants, view photos, control music and interface with Siri. Notifications like text messages keep track of daily news and sports teams and connect to social media. U.S. mobile proximity payments -- which include payments made with a smartphone through Apple Pay at the point of sale in place of a credit card or cash -- should reach $27.5 billion by 2016 and $118 billion by 2018, up from $3.5 billion in 2014, according to eMarketer. 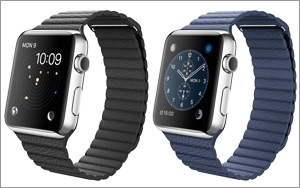 Apple released the WatchKit software development kit in November. Since then, developers have created thousands of apps. Apps will support advertising for Watch. Despite an absence of advertising on Apple Watch, for now, iAd took 2.6% share of the $18.75 billion U.S. mobile advertising market in 2014, up from 2.44% in 2013, per eMarketer. iAd took 5% share of the $9.65 billion U.S. mobile display advertising market this year, according to eMarketer, up from 4.9% in 2013. Apple also reported that it sold 5.52 million Macs, up from 4.84 million a year ago. Macs accounted for 9.3% of sales, and revenue reached $6.94 billion. Total sales for the period ended Dec. 27 jumped 30% to $74.6 billion. HBO Chairman/CEO Richard Plepher announced a new channel, HBO Now, to launch in April for 14.99 monthly, exclusively to stream through Apple TV. Cook said Apple has been working with medical researchers at top schools, like Oxford and Stanford, to develop applications that let patients of varying diseases participate in studies from an app on their phone. 2 comments about "Google, Apple War Over Wearables". Robert Niess from MKT, March 9, 2015 at 7:43 p.m. This is something that is truly an amazing product. It never underestimates me how much the Apple Company does to promote their product. They spend a mass amount of money on advertising and promotion and it yield amazing results. I personally have seen a lot of ads for the new apple watch and am very impressed the way that the advertisers are trying to reach a diverse group of people, by offering a lower priced watch to consumers who like the Apple products but yet they cannot afford to pay a huge amount of money for a watch, yet they are also able to appeal to people who want to purchase something that has a higher class look to it. Apple has also been able to target a wide range of people across cultures. Overall over the years Apple has done an amazing drop keep in tune with what people want. garrett perez from ASU, March 16, 2015 at 7:38 p.m.
Apple and Google, the two giants of the tech world. As we move forward I know that these will become the two largest competitors the world has ever seen. With sales reaching and breaking records almost every quarter, both companies are growing at an astounding rate. One may look at the situation as a win-loose game for the companies. While some aspects of that idea may be true, one must realize that this whole situation is not a win-lose but actually a win-win-win. Google will win in some areas, Apple will win in some areas. Most importantly, however, will be the consumer winning. Competition drives innovation along with lower prices. If only one of these tech behemoths was around, the monopoly would be stronger than when I play my little brothers in the board game (I take the game very seriously). All jokes aside, competition is great. In this area I feel Apple will come out the winner. The prevalence of iphones along with Apples recent partnering with banks such as Wells Fargo to implement Apple pay make the watch a clear winner. It is simpler and easier to use, and more places are going to start accepting Apple pay, which the watch has the ability to use. Regardless of who wins though, I am glad to see such innovation, and can not wait to pick either a Google or Apple watch up.